How can the funding more than double per student, yet LA Unified still be facing a financial crisis? Chief Financial Officer Megan Reilly posed that question as she explained the intricacies of the budget and laid out new numbers at Tuesday’s special board meeting. For example, she pointed out that by the end of the recession in 2009, the state was paying the district only about $5,200 per student. By the 2018-2019 school year, that number is expected to increase to $11,557 per student. That is due to the Local Control Funding Formula, which directs more money to lower-income and high-needs students. While that sounds like good news, Reilly pointed out that fixed costs will rise, taking up more of the budget in coming years. Today, in the 2015-2016 school year, 24 percent of the budget is spent on fixed costs such as pensions, retiree benefits and special education. By 2020-2021 it will be 33 percent of the budget. “But it will be slowing down,” Reilly said. 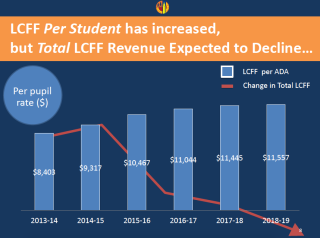 “The enrollment decline will overtake us in 2018-2019 and the LCFF will get less.” That’s why the district is in trouble unless action is taken. This is also one of the reasons why some district officials and board members are worried about the increase in charter schools. The LCFF money goes with the students, and if they transfer to a charter school, those dollars follow them. At the moment, 100,000 students are enrolled in the 211 independent charters that are overseen by LA Unified. 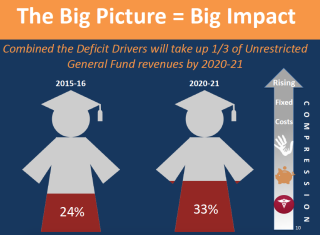 The district staff will explain to the school board their plans to decrease the deficit drivers at future meetings when they explore special education, pension costs and retired benefit costs. Even with enrollment going down, some of the fixed expenses will remain the same. For example, special education represents 16 percent of the budget, but it will increase to 20 percent. Reilly said the district doesn’t get adequate funding for special education in relationship to its cost, and she recommended that the district lobby for more money for it.